I had a great, brief discussion last night with a prospective buyer about the Hope Prep Freshman Handbook last night over on The Atomic Think Tank. 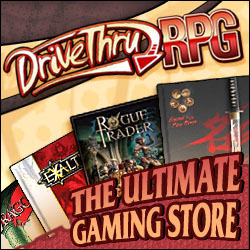 He initially expressed some dismay over the content included in the preview on DriveThruRPG. So, I tried to explain what was included a bit more thoroughly, explaining that what I thought he hoped to see in a preview wasn't really present in the ebook. Much to my surprise, my attempts to dissuade him from buying talked him into a purchase. He then provided some excellent feedback on the book, which we'll certainly be keeping in mind as we move forward. Mike Munshaw, the artist who handled all of the teacher artwork for the Freshman Handbook posted a collage of the interior artwork on his DeviantArt page. If you're trying to decide if our art is up to your taste, it's well worth a look.